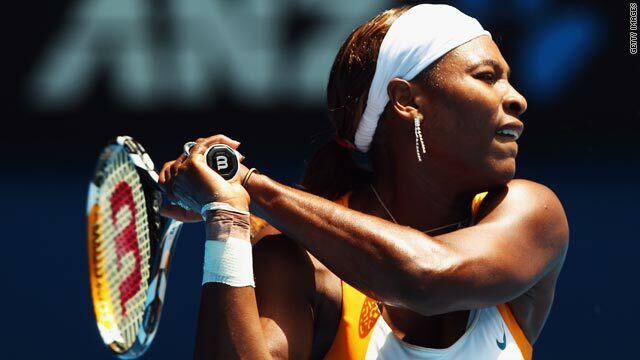 American top seed Serena Williams is seeking to win the Australian Open title for the fifth time. (CNN) -- World No. 1 Serena Williams kept up her remarkable record at Grand Slam tournaments as she opened the defense of her Australian Open tennis title with an emphatic victory on Tuesday. The American crushed Urszula Radwanska of Poland 6-2 6-1 despite again having her right thigh heavily strapped, having injured it before losing in the final of the Sydney International last weekend. She has never lost in the first round in any of the sport's four main events, extending her career record to 41-0 in such matches as she seeks to win the tournament for the fifth time. "Records are meant to be broken, so I was a little nervous today," Williams, who next faces Czech teenager Petra Kvitova in the second round, told the WTA Tour Web site. "I said, 'God, I hope this won't be broken. It's my personal record. I don't know if it's any record, but it's my personal record. I want to just keep it up.' This one means a lot to me because I love playing in Grand Slams and I love doing the best I can. "To have an opportunity to have not lost yet in the first round of a Grand Slam -- knock on wood -- is really good for me. It's something I want to keep up the rest of my career. I hope that's not too much to ask." Serena's older sister Venus, who lost to her sibling in the 2003 final in Melbourne and is in the same half of the draw this year, also progressed with few problems. The sixth seed defeated Czech Lucie Safarova 6-2 6-2, her 27th win in 28 encounters with left-handed players, to set up a clash with unseeded Austrian Sybille Bammer. Eighth seed and 2008 semifinalist Jelena Jankovic will next play unseeded Briton Katie O'Brien after defeating Monica Niculescu of Romania 6-4 6-0, while 11th seed Marion Bartoli will take on Sandra Zahlavova following her straight sets win against Rossana De Los Rios of Paraguay. They were joined in the second round by 13th seed Samantha Stosur of Australia, Russian 19th seed Nadia Petrova and former world No. 1 and 2008 finalist Ana Ivanovic, seeded 20th. The Radwanska family will be represented in the second round, with Urzsula's sister Agnieszka beating Germany's Tatjana Malek 6-1 6-0. The 10th seed will next play Alla Kudryavtseva after the Russian defeated American Melanie Oudin 2-6 7-5 7-5.